The latest recruit to the Great Wine Capitals provides the perfect way to experience the exciting Chilean wine scene, says Peter Richards MW. 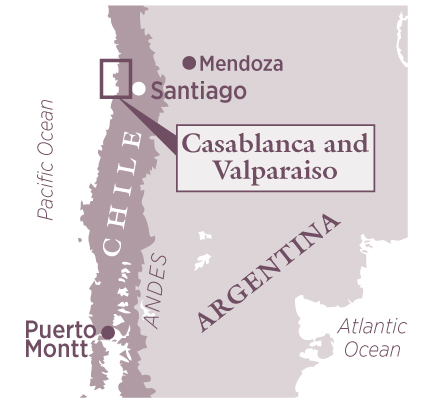 The Casablanca wine region and port city of Valparaíso make an odd couple, but a compelling duo. The former is serene, bucolic and with only a short history in winemaking terms. Valpo, as its residents affectionately know it, is busy, vibrant, colourful and with a proud history stretching back to its foundation in the mid-16th century by conquistadors. Yet together they make for an excellent visit and a great way of getting to know not just Chile’s modern wine scene but also everything from its culture, geography, history and politics to its graffiti artists. Recently, the two were jointly added to the select list of 10 Great Wine Capitals global network in recognition of this appeal. Chile is a country in which history happens fast. Until the 1980s, Casablanca was used for grazing livestock or growing wheat. That was until Pablo Morandé, then working for Concha y Toro, noticed its similarity to coastal California, hence its potential for cooler-climate premium wine styles. This sparked something of a vinous gold rush, followed by a period when momentum seemed to stall, before the region was revived latterly by quality- conscious and often eclectic producers including the likes of Montsecano, Kingston Vineyards, Casas del Bosque – and Pablo Morandé playing the maverick once again, this time with Bodegas Re. In fact, experiencing Casablanca’s cutting edge is not a bad way to start a visit to the region. Bodegas Re (bodegasre.cl) is a top tip – and not just because of its mould-breaking, stunning wines. As well as the fascinating cellar, peopled by giant egg-shaped wine vats and all manner of oversize earthenware jars, there is a balsamic vinegar room and a wall-full of artisan liqueurs marinating in demi-johns to choose from. It’s impossible to emerge from this visit without your view of Chilean wine being fundamentally altered for the better. 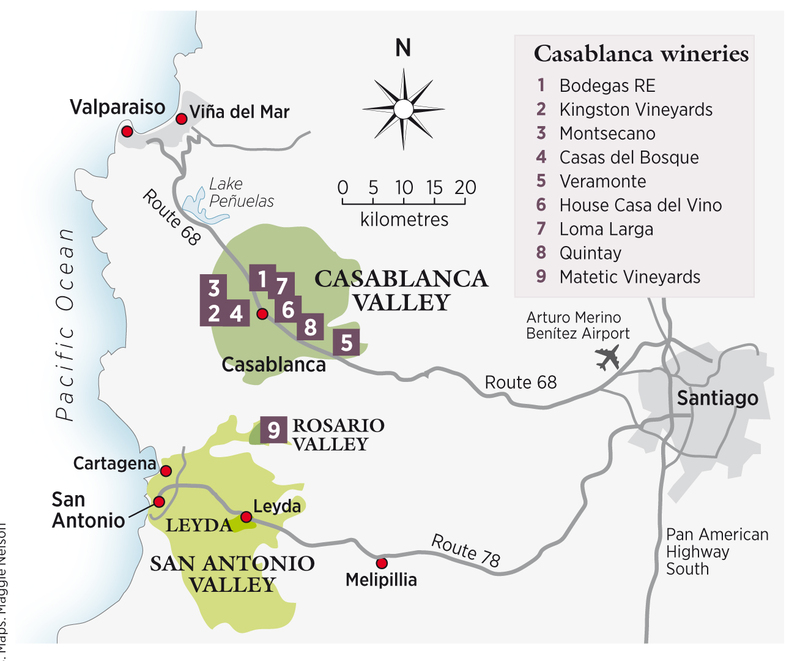 A bit more planning is needed to visit Kingston (kingstonvineyards.com) and Montsecano (montsecano.com), located in Casablanca’s slightly more inaccessible western reaches and for which tours need to be requested and scheduled in advance. But it’s well worth trying, especially when the wines are so intriguing. Kingston is a US-owned project turning out some very special Syrah and Sauvignon Blanc, while Montsecano’s beautifully rugged, ebullient Pinot Noirs are made by André Ostertag of Alsace. Just a stone’s throw from Kingston is Casas del Bosque (casasdelbosque.cl). Winemaker Grant Phelps is making outstanding Sauvignon Blanc, Syrah and even sweet Riesling. Try to catch Phelps if you can because not only is he a born entertainer, he’s also a font of knowledge on Valparaíso, where he lives. There’s plenty to do outside the vat room, too – a bike ride up to the Mirador affords not only an excellent panorama of the area but also an excellent excuse to indulge at the highly regarded Tanino restaurant. While the blustery hills and weathered red granites of western Casablanca have tended to provide much of the more recent wine excitement in the region, it’s worth visiting other producers around the valley. Veramonte, in Casablanca’s eastern hills (on the right just after you emerge blinking from the Zapata tunnel), is a name many will know and has an exciting new wine team lead by Rodrigo Soto, formerly of Sonoma’s Benziger (veramonte.com). House Casa del Vino is a good shop, restaurant and mini-winery with excellent wines on show, while the likes of Loma Larga and Quintay also offer some outstanding bottles. In its vibrant wine and restaurant scene, modern Casablanca has much to offer the visitor. When it comes to accommodation, one option is to continue the wine theme and head south to stay in the peaceful setting of the Rosario Valley in San Antonio, courtesy of Matetic (maybe taking in a quick visit to Nobel Prize-winning poet Pablo Neruda’s house and grave at Isla Negra in the process). But any serious visitor needs to face the cooling breeze and head to the vertiginous hills and colourful chaos of Valparaíso on the coast. Those after an orderly, more comfortable and classically touristy experience should head up to Viña del Mar, which is effectively a northerly extension of Valparaíso. By contrast, the joy of Valpo is precisely in its unruly, disorderly hills and side streets, its very peculiar brand of moth-eaten elegance, its energy and creativity fuelled by students and artistic types, its funiculars and trolley buses, its precipitous views – and a food- and-drink scene that is rapidly developing. Although the city was hit by a calamitous wildfire in April 2014, it has since bounced back – after all, Valpo has withstood earthquakes, a sacking by Sir Francis Drake and the economically devastating advent of the Panama Canal. In 2003 it was named a UNESCO World Heritage site. Valpo, in short, is a city that rewards those with a natural curiosity, healthy thirst – and a good pair of walking shoes. Because of the way the city is built on hillsides overlooking the port, space is at something of a premium. Roads can be narrow and steep; rooms often make up for their lack of floor space with elegantly tall ceilings and windows. The best hotels, like Casa Higueras or Palacio Astoreca, have managed to retain the sense of Valpo’s intriguing past while providing modern creature comforts. There’s nothing quite like watching the sunset from a well appointed Valparaíso balcony while sipping on a glass of Casablanca Sauvignon Blanc or pisco sour and sharing the view on social media courtesy of a decent wifi connection. Within Valpo, there are many things to do. Riding on the funiculars and generally exploring the hills and quays while peeking in on buzzy cafes and bars comes highly recommended, with the virtue of discovering the quirky spirit of the place for yourself. The brutalist National Congress is perhaps worth a quick glance but more culturally rewarding are the bustling food market at Mercado Cardonal, with local restaurants above, and the Museo de Historia Natural. And check out La Sebastiana, Pablo Neruda’s typically cluttered and eccentric local base.